2019 KTM 690 Enduro R First Look—KTM has just released details on it’s updated KTM 690 Enduro R. Major updates include a redesigned LC4 engine claiming more horsepower and torque with less vibration. Two ride modes (Sport and Street) with cornering ABS, lean angle-sensitive traction control, motor slip regulation and Quickshifter+ all join the Enduro party. (If you’re into supermoto hooliganism, check out the 690 Enduro R’s cousin with slicks in our 2019 KTM 690 SMC R Supermoto First Look). The 2019 KTM 690 Enduro R looks to get more range for more riders in 2019. 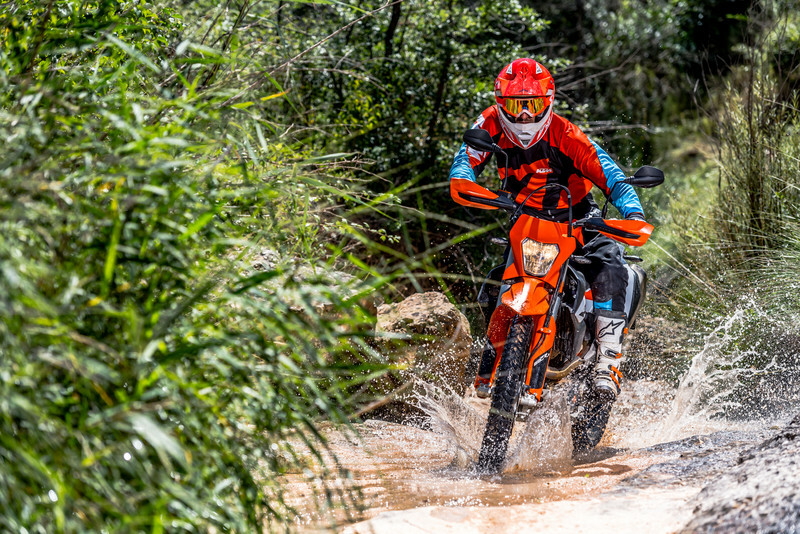 The popular single-cylinder dual-sport machine has a fanatical following of off-roaders looking to stretch their legs a bit more than smaller displacements can. It’s also highly attractive to adventure bike riders looking for something smaller and lighter than the behemoths of the class. But, it’s seat height and fuel capacity has left many wanting more. Well, now they get more (and less) with .4 gallons more fuel (3.5 gallon capacity) and a shorter seat height (now at 35.8″) for 2019. Holding it all together is an updated chassis with a new subframe (that’s also the fuel tank) and new WP XPLOR suspension components. 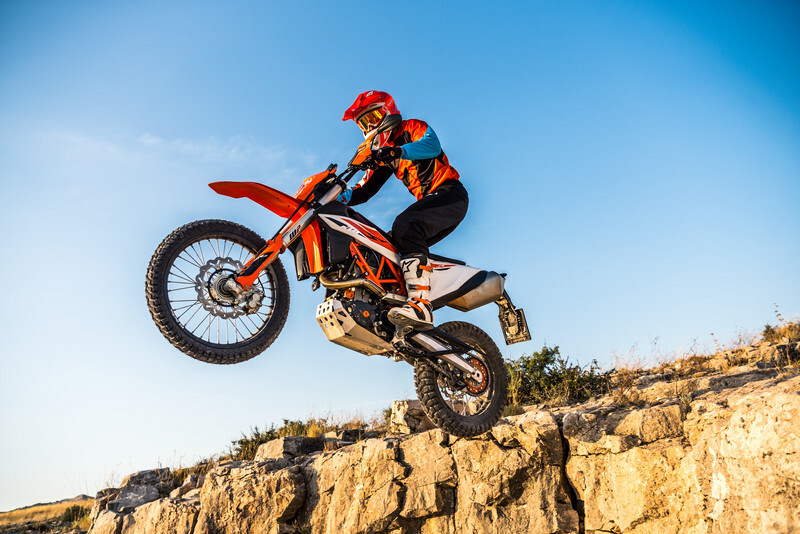 The 2019 KTM 690 Enduro R is definitely capable off-road. NEW Dynamic LC4 single-cylinder engine with less vibration and more power featuring electronic fuel injection, Ride-by-Wire technology, dual balancer shafts, PASC slipper clutch and 6-speed gearbox. NEW styling based on the EXC family for a more aggressive look and enhanced ergonomics. NEW chassis for optimized rider feel and control with a lower seat (910 mm / 35.8 in) while keeping the same suspension travel. Fully-adjustable WP XPLOR suspension with separate damping circuits and 250 mm (9.8 in) of travel for the best offroad suspension on the market. Cylinder head with dual ignition featuring individual timing control for optimal combustion. Stainless steel exhaust with catalytic converter. Self-supporting polymer rear fuel tank. High quality Brembo braking system combined with lightweight waved discs. Technology-leading Cornering ABS with Offroad mode (to disengage rear ABS) for hard braking under all circumstances and the Quickshifter+ for smooth clutchless shifting. Motorcycle traction control (MTC), motor slip regulation (MSR) and Street and Offroad ride modes that can be switched directly from the handlebars for controlled power delivery.